Learning how to cook scallops can be a simple process. While scallops require precise cooking times to avoid over or undercooking them, the methods you use to cook them are quite simple. Once you've learned how to cook scallops, this delicious and delicately flavored seafood can be the star of your meal. A scallop is a bivalve sea creature - much like an oyster, mussel or clam. The part of the shelled scallop that is typically sold in markets is the adductor muscle of the scallop. This is the muscle that hinges the shell. The two most commonly used varieties of scallops are bay scallops and sea scallops. 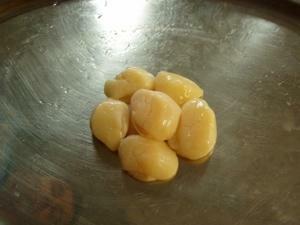 Bay scallops are smaller in size and extremely tender when cooked properly. Bay scallops are large and slightly less tender; however, they are still sweet and delicious. Bay scallops are more commonly used in pasta and other dishes, while sea scallops are used as stand alone protein. Scallops are highly perishable. They are almost always sold shelled, because scallops in the shell need to be kept live, and live scallops need to move around a lot in order to stay alive. When selecting shelled scallops, avoid scallops that are sitting in water or scallops that are pure white in color. Both of these are an indication that the scallops, which are extremely absorbent, have absorbed a lot of the water or chemicals. Select fresh scallops that are an ivory color to a light pink color with a moist appearance. Smell the scallops for any off or fishy odors. You may also select to purchase flash frozen scallops which are available in the freezer section of the grocery store. Most of the scallops you buy at the grocery store are actually thawed flash frozen scallops. Thawing flash frozen scallops at home is easy. They can be thawed in a few hours in the refrigerator or by placing the scallops, wrapped in plastic, in a colander and running cold water over them. Fresh scallops should be refrigerated immediately and cooked the same day that you purchased them. Frozen scallops can be stored for up to three months in the main section of the freezer. Either freeze in the manufacturer's packaging, or, if purchasing bulk frozen scallops, double wrap in plastic to store. The biggest trick when learning how to cook scallops is learning how not to overcook them. Overcooked scallops are tough in texture and lose some of the sweetness that is natural to them. As soon as a scallop has lost its transparency, it is cooked, so watch them closely as they cook. Before cooking scallops, it is important to dry them. Pat the scallops gently with a paper towel to remove the moisture from their surface. Many feel that sautéing scallops is the best way to cook them. Scallops can be sautéed in butter or olive oil. Many feel that the sweetness of the butter compliments the sweetness of the scallops. If using butter, you may want to use clarified butter, which has a higher smoking point than regular butter.To sauté scallops, preheat the fat in a sauté pan until it simmers. Place the dried scallop in the fat and cook until lightly browned on each side, turning once. Cooking time will vary with the size of the scallop, so watch the side of the scallop. When the opacity has reached the halfway point, flip the scallop and repeat on the other side. Dusting the scallop with a little flour prior to cooking can enhance browning. A simple way to do this is to dip the scallop in milk, shake off the excess moisture and then very lightly dust it with flour, taking care to shake off any excess flour. To bake scallops, place them on a foil lined pan that has been liberally greased. Place the pan in the oven and bake for about 12 to 15 minutes. The scallops are done when they are white in color and slightly firm to the touch. To broil scallops, place them on a greased baking sheet and liberally brush them with butter. Place the scallops three to four inches under the heat source and watch them closely. They are done when they are white and firm to the touch. Salt scallops to taste after cooking.